North America’s Leading Anime & Manga Publisher Presents Legendary Manga Artist Takeshi Obata And Details Special Panels, Exclusive Retail Items, Booth Activities, Screenings And More! San Francisco, CA, September 30, 2014 – VIZ Media, LLC (VIZ Media), the largest distributor and licensor of manga and anime in North America, brings a potent dose of anime and manga excitement to New York City as it announces four consecutive days jam-packed with special events and convention exclusives for the 2014 New York Comic Con. VIZ Media rolls into the Javits Convention Center between October 9th– 12th for the East Coast’s biggest and most exciting popular culture event that features the latest and greatest in comics, graphic novels, anime, manga, video games, toys, movies, and television. VIZ Media will be located in Booth #1944. Full details on New York Comic Con are available at: http://www.newyorkcomiccon.com. VIZ Media will delight NY Comic Con goers with a thrilling schedule of an ultra-rare manga (graphic novel) artist live guest appearance, WEEKLY SHONEN JUMP, SAILOR MOON and VOLTRON panel discussions, prize-winning booth activities, VOLTRON, DORAEMON and SAILOR MOON photo opportunities, as well as special artist meet-and-greet and signing sessions, exclusive retail products and a host of convention anime screenings. Join VIZ Media to welcome one of Japan’s preeminent manga artists – Takeshi Obata – for his first-ever U.S. personal appearance! The groundbreaking artist of smash hit manga series such as DEATH NOTE, BAKUMAN?, HIKARU NO GO, RAL?GRAD and ALL YOU NEED IS KILL will appear in-person at several events during the 2014 New York Comic Con. VIZ Media presents Takeshi Obata in-person as part of its WEEKLY SHONEN JUMP panel programming as well for an exclusive appearance and signing. Stop by the VIZ Media Booth in the Javits Main Hall for details and to secure advance tickets for the exclusive New York Comic Con Takeshi Obata signing, taking place Thursday, October 9th from 7:30pm to 8:30pm at the Javits Center. Obata will also make a pair of additional off-site appearances at Kinokuniya and Barnes & Noble bookstores as part of New York Super Week. Full details are available at: www.newyorksuperweek.com. Stop by the VIZ Shop located in the VIZ Media Booth for a wide selection of manga and anime titles, collectables and special convention exclusives. Manga fans can pick up pre-street copies of ALL YOU NEED IS KILL, RESIDENT EVIL (Vol. 1) as well as the shojo premiere of KISS OF THE ROSE PRINCESS and PRINCESS MONONOKE THE FIRST STORY, a new hardcover storybook from the Studio Ghibli Library featuring watercolor art by Hayao Miyazaki, the film’s legendary director. Collectors and pop culture aficionados will not want to miss special Convention Exclusives that include editions of the HELLO KITTY, HELLO 40 Commemorative Art Book, with a foil-accented cover and gilded pages – only 250 copies printed, and the BRAVEST WARRIORS: THE SEARCH FOR CATBUG book, also a special limited edition with foil-accented cover and gilded pages – only 250 made – celebrating the smash hit adventure series created by Pendleton Ward. Also don’t miss the New York Comic Con Exclusive edition of VOLTRON: FROM DAYS LONG AGO, A 30th ANNIVERSARY CELEBRATION book. VIZ Media will welcome artists from all of these titles for special booth signings throughout New York Comic Con. Check the daily booth schedule for posted times. Fans with a penchant for anime can pre-order a forthcoming copy of SAILOR MOON Set 1 Part 1 (DVD/Blu-ray) ahead of its November release in partnership with RightStuf.com. 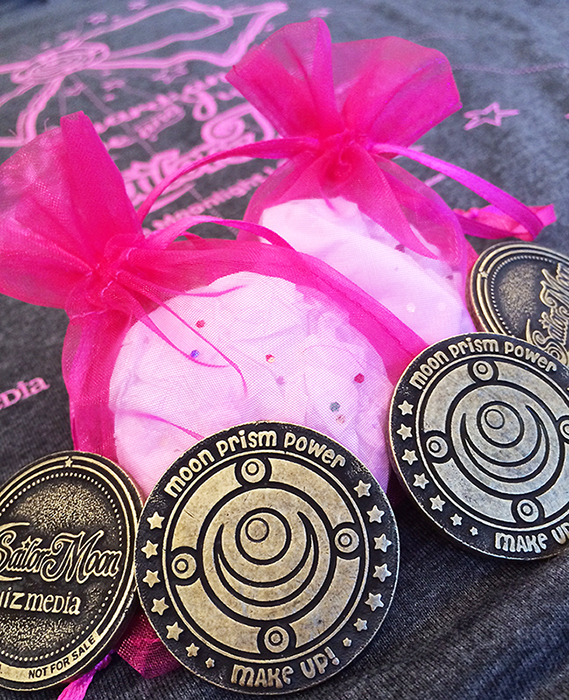 Receive a special SAILOR MOON collectable coin as a free gift with pre-order convention purchase (while supplies last)! Attendees also can select from a variety of other VIZ Media Blu-ray and Combo Pack releases currently available including GARGANTIA ON THE VERDUROUS PLANET, BLOOD LAD, RANMA ½ and more! Also available for purchase will be a limited quantity of new, exclusive New York Comic Con SAILOR MOON convention t-shirts as well as replica BLEACH sword umbrellas, with two different design variations featuring the sword hilt of Soul Reapers Rukia or Ichigo. Also grab a sneak peek at the first officially licensed North American DORAEMON products, and an exclusive selection of hand numbered ONE PIECE and NARUTO replica art prints, along with many, many other items. Join VIZ Media and pull back the curtain on favorite manga and anime series. Be among the first to hear about upcoming releases and new acquisitions and throw questions at staff and grab FREE manga prizes while supplies last! Join the editors of VIZ Media’s WEEKLY SHONEN JUMP and editors from Japan’s Weekly Shonen Jump magazine to welcome Takeshi Obata for an enlightening personal discussion on what’s new and what’s next for the long-running manga anthology which launched best-selling titles such as NARUTO, BLEACH, ONE PIECE, DRAGON BALL as well as Obata’s BAKUMAN?and DEATH NOTE series. In 1984, Voltron: Defender of the Universe hit the TV, and the world of giant robots has never been the same. In honor of Voltron’s 30th anniversary, join the staff of VIZ Media’s Perfect Square imprint for a very special peek behind the curtain at this cultural phenomenon with special guests, new product announcements and much, much more! Join VIZ Media and the staff of WEEKLY SHONEN JUMP to welcome very special guest Takeshi Obata and his editor Koji Yoshida for a conversation about Obata’s beginnings as an artist, his extensive history working in the manga industry, and the creative process behind his works. Don’t miss this extraordinary opportunity! Come on a journey with the legendary Guardian of love and justice, Sailor Moon! Members of the VIZ Media SAILOR MOON animation team will talk about the impact of this beloved anime series, show footage from the re-mastered episodes and celebrate the long-awaited return of Usagi and her friends! The VIZ Media booth will buzz with continual activity throughout New York Comic Con with a host of fun in-booth games and activities. VIZ Media Prize Wheel of Destiny: Take a spin for a chance to win a surprise goodie like t-shirts, posters, stickers and more! While supplies last. DORAEMON Meet & Greet: Drop by for a photo op with everyone’s favorite big blue cat-type robot from the future! SAILOR MOON PHOTO SESSION: Meet Guardian Sailor Moon (official cosplayer) and bring your own camera/phone and take your own “Sailor Selfie”! VOLTRON Mascot Appearance: Become a Defender of the Universe with an official photo. VIZ Media /WEEKLY SHONEN JUMP Newsletter Sign-Up: Receive the latest digital news about your favorite anime and manga titles and get a free Takeshi Obata full-color poster! Convention goers should check the daily master schedule for a complete listing of that day’s confirmed in-booth activities. Catch some of VIZ Media’s hottest and newest anime titles with special premieres happening throughout the New York Comic Con. Don’t miss special presentations of NARUTO THE MOVIE: ROAD TO NINJA, SAILOR MOON CRYSTAL & SAILOR MOON (Original Series), BLOOD LAD, RANMA ½, GARGANTIA ON THE VERDUROUS PLANET, and TIGER & BUNNY THE MOVIE: THE RISING. For more information on anime and manga titles published by VIZ Media, please visit www.VIZ.com.